Cooking is one of the ways I relax. I love creating new recipes, new ideas with food, and I can imagine myself as Gordon Ramsay one day. Well, minus the soccer background. One of the things I love to do is play with herbs and seasonings. I go rouge with them a lot, and often go away from mainstream. 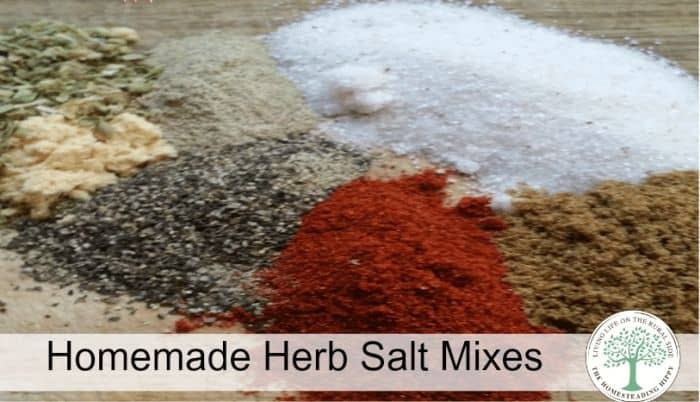 Today, I am going to release the secrets and share with you how to make herb salts. First, you will need salt. I personally choose RealSalt, because it has some minerals left in it, has lots of flavor and is still affordable. Other good salts for this are Himalayan, or Kosher. Using plain table salt will get you a very salty recipe and may not work as well. Plus, there are the health risks with using plain table salts that you really don’t want… so just don’t. Each recipe can be halved, doubled, or tripled as needed. This is my “go to” salt for seasoning just about everything from eggs to fish and chicken. It sits on the counter in a pinch bowl for easy access as well. This is great on steaks, burgers, or anything else you want to toss on the grill. I also have used it in mashed potatoes, on baked potatoes and anywhere a “kick” is needed. Great for fish, pasta, or compound butter seasoning. This has a lemony kick that tastes great on chicken too. This is great for anywhere you would use chili powder. In chili, in homemade taco seasoning, or and added kick to sauces. I love how beautiful and vibrant spices look all laid out next to one another. I have been thinking I need to put together some spice blends to have on hand. It would save so much time! Thank you for posting this. I love making my own seasonings!